The basic mechanical events associated with muscle contractions are common in all animals, whether it be an octopus grasping prey with its tentacles or a track star competing in the 100-meter dash. In 1954, two unrelated English biologists named Huxley independently discovered the mechanism by which skeletal (voluntary) muscles contract and published their findings in back-to-back articles in the journal Nature. The elder of these two Huxleys, Andrew, came from a distinguished family whose members included the biologist Thomas Henry Huxley (grandfather), as well as the writer Aldous (half-brother). Hugh Huxley, by contrast, grew up in a middle-class home. Both Huxleys attended Cambridge University and had their studies interrupted by service during World War II. After the war, Andrew resumed work with Alan Hodgkin, studying the nerve action potential—work for which they were co-recipients of the 1963 Nobel Prize. In 1952, he determined how muscle contracts using a microscope of his own design. Hugh Huxley resumed his doctoral studies in 1948, focusing on the molecular structure and function of skeletal muscle using X-ray diffraction and electron microscopy. He continued this work at Massachusetts Institute of Technology in 1952, and in 1954, published his sliding filament theory of muscle contraction, using different methods from Andrew Huxley, but reaching the same basic conclusions. Skeletal muscle consists of fibers that run parallel to the length of the muscle. Within each fiber (muscle cell) is a myofibril that has a striped appearance formed by a repeating series of thousands of sarcomeres, the contractile unit of the muscle. Within each sarcomere is a series of actin (thin) and myosin (thick) filaments, which lie in parallel to each other. During contraction, the thin actin filaments change their length, while the length of the myosin filaments remains unchanged. Hugh Huxley proposed that when actin slides past myosin, it creates muscle tension. SEE ALSO: Animal Locomotion (1899), X-Ray Crystallography (1912), Electron Microscope (1931), Action Potential (1939). Atlas flexes his muscles in this statue at Pathos, Cyprus. 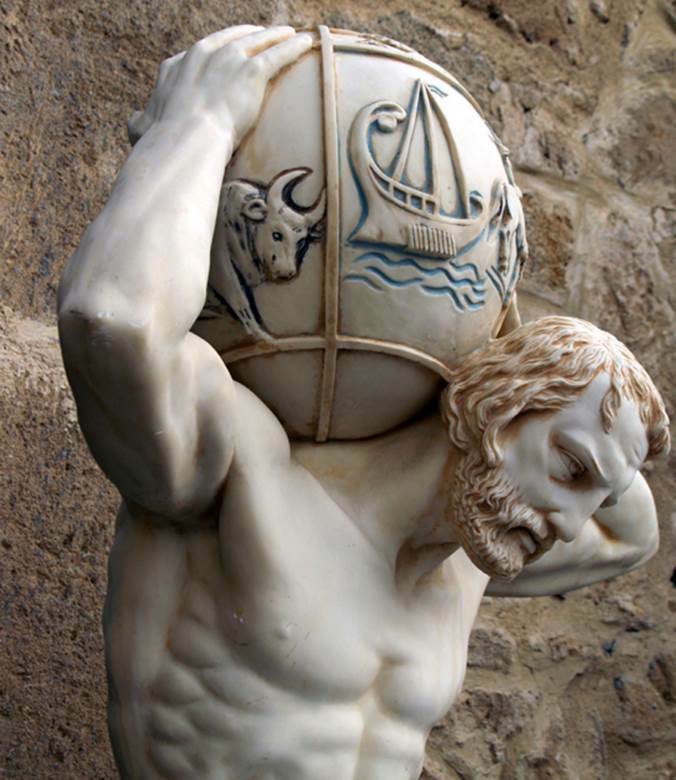 Atlas is commonly depicted carrying the Earth on his shoulders, but in the original myth, as a punishment, he was made to bear the weight of the heavens.